It is a well-known sound bite that we frequently hear from our ICT Leaders in New Zealand. “We need to encourage innovation. New Zealand must become more innovative.” Despite this, it seems that as you increase the size of the company or organisation you work with, you increase the possibility that a good idea, innovation, will be murdered somewhere in a corporate corridor. There is a list of reasons that innovation is killed a mile long, however one of the most prolific killers of innovation is Groupthink. In order to reduce conflict in a large group people try to find any kind of consensus regardless of whether or not that consensus actually makes sense. All reason and science is thrown out the window in the mad rush to reduce conflict. Then, once the consensus has been reached, any non-member of the group who comes to it with a different idea, so challenging the consensus, is killed off quickly. This is because the group does not want to return to the original conflict state and so enthusiastically defends itself from outside ideas and influence. Unquestioned belief in the group, causing members to be unable to see the consequences of their actions. Categorising those who are opposed to the group (challenge their ideas or bringing new ideas) as stupid, having no power, spiteful, ignorant, biased, weak, and of no importance. The illusion of unanimous consensus. Silence is seen as agreement. Anyone within the group who challenges the status quo, or questions the group, is seen as disloyal and may be excluded. “Doomsayers” are ejected and the group is told to “think positively”. People who assume the role of mind guards; a role that assimilates and destroys any information coming into the group that is seen as dissenting. Failure to assess alternatives or new ideas. Outright rejection of the same, justified by the group in any number of ways that reinforce their collective view. Failure to examine risks adequately. Failure to reconsider alternatives that have been previously dismissed. A plethora of anecdotal information owned by the group members and used as reasons to oppose an idea as opposed to empirical analysis. People who try to bring a new idea into that type of environment, whether they are sales people, architects, innovators, staff who just have a great idea, or agents of change will find a range of signs that they are in trouble. These are the natural defensive reactions of Groupthink and when clustered together can represent a serious barrier to an innovative idea, or ultimately, be the murderer of that idea. Barred access to the actual decision makers within an organisation by the group. Being told that you are not following a process or methodology (or standards, guidelines, and policies) that the group understands, however doesn’t share easily with you, can morph into different forms, is onerous, and /or is not accessible to you except through the members. Unscientific risk analysis of your idea leading to it being dismissed as “too risky”. Prioritisation by the group of your idea to low without any formative analysis of its importance or value. Barred access or no response by the group and its members. Complaints that you are “negative” and “not following the rules” often escalated to senior management to come back down via your management. Small meetings with individual members of the group suddenly turning into “town hall meetings” where the entire group turns up to challenge you. No clear decision-making process or authority. Meetings where the same issues are discussed again and again with no resolution or accountability to resolve. No record keeping of meetings. I’m sure that you can come up with dozens more examples. There are solutions to dismantling Groupthink or preventing it from occurring, unfortunately for the innovator these are not actions they can easily take, it requires an organisation to either a) recognise the risk that Groupthink may occur and b) in cases where it has occurred, accept it, and act. When building a team, balance it. If you have a team, understand it. Utilise Belbin or Briggs Meyer and an expert in the area to analyse what you need or what you have. This works. Don’t assume you can build a balanced team. Treat conflict as a necessary part of daily work and life. Conflict is not “good” or “bad” it is necessary. Where it becomes negative is in the method by which it is resolved. Set down rules and agree how conflict will be managed. No question, idea, perspective, or thought is stupid, invalid, or dumb. Create an environment where it is safe, see 2, for people to bring their ideas. Encourage it. Allow structured decision-making time for a team and its visitors. Consider using Kepner Tregoe or another sound decision-making process. Consider using a facilitator for large, complex, and confrontational decisions. Bring in the “devil’s advocate” under the conditions above. Assign a devil’s advocate to every meeting. Expose your team to outside experts. Encourage your team to visit similar organisations, agencies, and companies that have been faced with issues that you have. Foster networking. Challenge “yes” people and encourage quiet people to bring their thoughts forward. If you are the leader or manager, do not bring your own ideas and pre-conceptions to discussions. Examine successful and innovative companies and organisations. Do not engage in confrontational (the bad variety) behaviour. Listen & leave. Identify the people who can make your idea happen. Work with them and avoid those who have expressed a desire to kill your idea. Identify the ultimate decision-maker. Think about how to get your idea to them. Avoid town hall meetings like you would avoid the plague. Listen to feedback and make sure that you critically analyse and adjust your idea where you need too. Recognise that your idea might not be good, but have faith that it is, until proven otherwise. Act with integrity and honesty. Do not be pulled into “bad politics”. 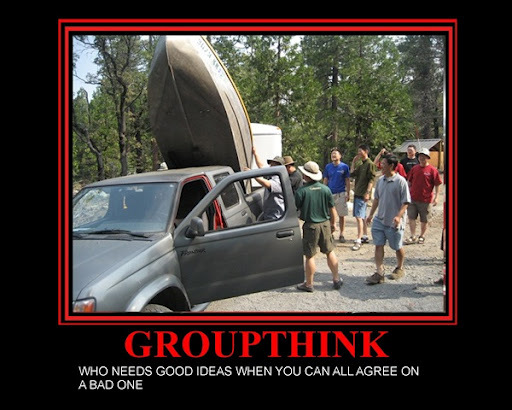 Do not join a group you think is suffering from Groupthink. Be kind. You will be surprised at how effective this is. Don’t yell at anyone unless they are on fire, or the building is. Choose who you tell about your idea and when. Don’t throw pearls before swine. Realise that you may not succeed and prepare for it. A lot of people and organisations are not ready for innovative and new ideas. At the end of the day in order for New Zealand to foster innovation, the culture of Groupthink must be recognised as a risk or an issue company by company and organisation by organisation in order to allow ideas to flourish and stand on their own feet.